It’s not hard to find world-leading technology designed by Canadians at the annual Consumer Electronics Show here in Las Vegas. All you have to do is check out the video-game displays. At the gigantic Microsoft booth, one of the games receiving a prominent showcase is Mass Effect 2, the sequel to the 2007 smash hit from Edmonton’s BioWare. The first Mass Effect, a Star Wars-like science-fiction role-playing/action game, garnered universal acclaim and sold more than a million copies in its first three weeks of release. The sequel, also exclusive to Microsoft’s Xbox 360 console and PCs, will be released on Jan. 26 and is expected to be one of the first big hits of this year. 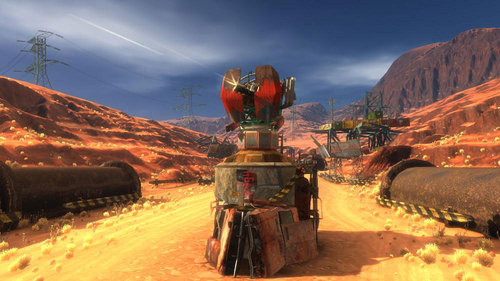 The game was designed by a staff of 150 in Edmonton, with help from BioWare’s studio in Montreal. Casey Hudson, the game’s executive producer and project director, spoke with CBC.ca at CES about the upcoming game. CBC.ca: The first Mass Effect was a huge hit, so what’s the second one about? What’s new and exciting? Hudson: With Mass Effect 1, we launched a new science-fiction universe and a lot of people got really excited about what’s going on in the story, which is that you play Commander Sheppard. Sheppard is a normal human soldier from the Human Alliance on Earth and we’re just sort of newcomers to the galaxy. We discover that approximately every 50,000 years, there’s this race of enormous machines that comes in and harvests all life. Sheppard, your character, is the one who knows about this and is trying to figure it out. Mass Effect 2 is the middle part of the trilogy, we’ve always designed it as a trilogy so we know where the story’s going. You don’t have to have played the first one but if you have, you can bring in your saved game and start up where you left off. Same character, same decisions, everything cascades forward, the universe is the way that you left it. Mass Effect 2 is the darker, second act. You’re actually getting much closer to the real threat and finding out what’s really going on. CBC.ca: Is it like The Empire Strikes Back of the trilogy? Hudson: Exactly. Ultimately it leads into what is essentially a suicide mission. You know you’re getting ready for this suicide mission at the end so you’re trying to recruit the best characters, the toughest people in the whole galaxy. You’re not only recruiting them, you’re trying to gain their loyalty and learn about who they are before you go off on this mission. CBC.ca:What’s the new in the game play? Is it safe to assume you’ve made changes and improvements? Hudson: Mass Effect 2 is a shooter/RPG [role-playing game]. The difference this time around is the combat is much more polished. It really feels like a top shooter when you play it but beyond that of course it has this incredible story. It’s a non-linear storyline with choices and things like that. The combat itself is very precise and you have all sorts of amazing weapons. You’ll probably end up choosing your weapons on feel rather than numbers and stats. When you pick up a weapon, it actually feels different, you’ll know that you like this weapon versus that one. It has a real action-oriented feel as part of being of a really good shooter/RPG. Hudson: I’ve heard that [grins]. CBC.ca: So the personal relationships are there in this one as well? Hudson: There was a lot of talk about Mass Effect 1 and what was in it, but most of it was from people who hadn’t actually seen or played the game. Those who have played the game, of course, it’s their feedback that’s most important to us and what they would have seen is that we always feature a love interest. It’s like a PG-13 action game. You’ve got all this incredible action, witty dialogue and you’ve got a love interest, which is part of making the story more human. That’s what we always do and Mass Effect 2 has an approach very similar to what we did in Mass Effect 1. It’s a tasteful way of adding a really interesting human emotional angle to why you should care about what’s going on in the universe. One difference now is that we have a larger cast of characters, so we’ve got 10 squad members instead of the six maximum. That’s more relationships, and every character has a relationship with you whether it’s a romance or not. You learn about them, a lot of them involve loyalty that you’ll try and earn from that character. In some cases, that explores the romance aspect, and then that character becomes the love interest for your character. CBC.ca: What’s next for BioWare? Hudson: We just released Dragon Age: Origins and that has some great downloadable content coming out. On the Mass Effect team we’re already starting to design Mass Effect 3, but at the same time we want to make sure Mass Effect 2 has a really great launch and is really well supported. We also have a really great lineup of [downloadable content] for Mass Effect 2 coming out for several months after we release it. CBC.ca: So would that be extra missions? Hudson: One of the great things we’ve been able to do with Mass Effect 2 is to make all the great aspects of the game expandable. We can release everything from a weapon to a helmet all the way up to larger packs, new worlds to explore or even larger expansion-pack-sized content. CBC.ca: Is there any sort of a target date for Mass Effect 3? Hudson: We don’t have one but we’re looking at a similar time frame as for the second one. We want to make sure it still fits into the current console cycle, and we also know that people are really excited to see what happens with the end of the story. We don’t want people to wait too long for that. CBC.ca: There’s a lot of talk about 3D here at the show. What do you guys think of it? Hudson: I’ve always personally been interested in 3D. I’ve always loved the idea of a VR headset, 3D monitors and TVs. I’ve actually seen both Dragon Age and Mass Effect on a 3D monitor and it’s incredible. It’s part of the future of gaming for sure, it’s just a question of how quickly the technology gets adopted. The great thing is once the hardware’s there, unlike a movie, a game is already 3D. It has all the things you need to make it 3D. So as soon as the hardware is there, the current games and potentially games we’ve already released may be ready for that.